The Hawkins & Brimble Shampoo and Conditioner both have the Elemi & Ginseng scent that runs through the Hawkins & Brimble range of products. It is a scent that is very different and one that I am rather liking and this is especially true in their beard oil that I am currently using at the moment. The earthy and woody Ginseng works well with the Elimi which might be a scent you haven’t heard of before? It’s an ancient resin that was used by the Egyptians in their embalming process, it is a resin from the Canarium Commune tree in the Philippines and is similar in scent to Frankincense, some describe it as peppery with citrus and it works so well with the Ginseng. Both the Shampoo and Conditioner are 250ml in size and come in a plastic bottle with a flip open lid, with squeeze to dispense top. The Hawkins & Brimble shampoo is a clearish liquid that has a slight oilyness to it and of course as I test a lot of beard care products, I tried it both on my head and in my beard and whilst it was great on my (very short) hair, it was alas not good on the beard but that is okay as it isn’t a beard product, I just wanted to see if it would be okay on my beard. It contains Contains Provitamin B5 and Ginger extract to treat the hair. The Conditioner is white and creamy and contains coconut oil to promote smooth and shiny hair, as I said I don’t have much hair, not because I don’t have hair but because I choose to keep it at a grade one. So with the Shampoo and conditioner, I then gave it to my daughters fiance to try and he has been using it ever since and really like it, unlike me he has hair to wash! Both the Shampoo and Conditioner are free from Parabens, Colourants, SLS/SLES, Mineral Oils and are not tested on animals. 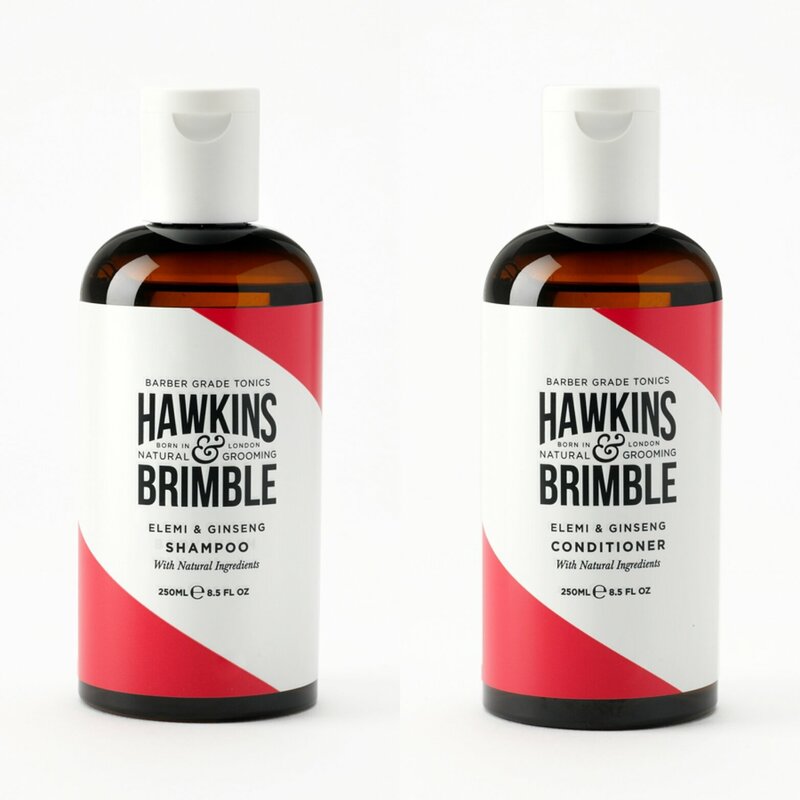 The 250ml (8.5 fl oz) Hawkins & Brimble Shampoo and Conditioner cost £8.95 each from the website or subscribe and save 15% on your first order and 5% on all remaining orders. You can keep up to date with Hawkins & Brimble on Facebook, Twitter, Pinterest, YouTube & Instagram. Expertly crafted in the UK and formulated with simple, natural ingredients, our approach to skincare yields unrivalled results. There are no weak spots – simple yet effective products that will deliver day in, day out. Hawkins & Brimble is more than just a collection of grooming essentials. We’ve revived traditional barber rituals that inspire pride in masculine traditions, so you can up your grooming game for good. Our carefully curated grooming edit includes shaving and skincare, as well as beard care and hair care. So no matter your style, we’ve got it covered. Delivering protection from the elements and packed with a delicate fragrance of Elemi and Ginseng, this subtle scent will make you feel and smell fresh no matter how busy your day gets. Hawkins has been expertly tailored for the discerning man who knows what he’s doing and where he’s going. Our grooming collection is effortless yet edgy, playful yet polished and promotes a subtle yet sophisticated routine that is easy to adopt.It’s for those who want to look good with just a little know how. After all, an investment in your appearance will always pay off.